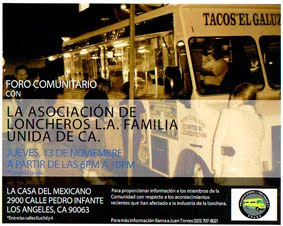 Drive around East LA any given night just after dark and you will see the outlaw taco cart. 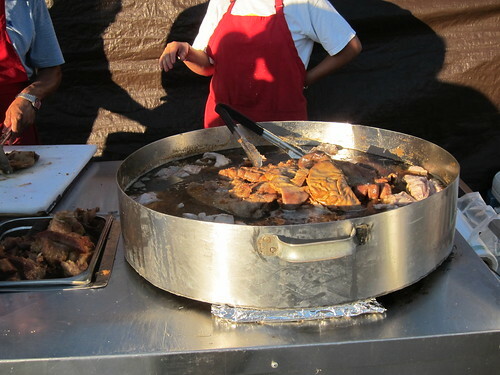 Sometimes it’s a minor operation – a lonely looking al pastor trompo, sometimes more elaborate with pots and steam containers cooking everything from cabeza to tongue to buche. 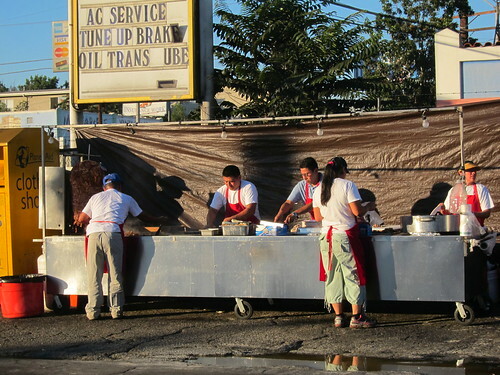 Sometimes the outlaw taco carts are set up in front of driveways, sometimes on the lot of an auto mechanic or car wash. Many are just on the sidewalk. For the most part the specialty of the outlaw taco cart is the al pastor spit, a hunk of pork that slowly cooks in front of a heat burner. But for many the treat at these taco carts is the offals ; tripas and buche(pork stomach)boiled, then grilled until crisp and paired with a variety of garnishes and salsas. For the most thorough rundown of Eastside taco tables on the internets check out the blog Eat Drink & Be Merry. 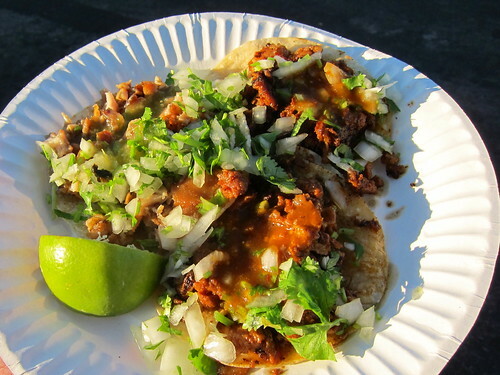 The night is the outlaw taco cart’s domain but there are some, such as this taco cart in Glassell Park that push the boundaries and operate when it’s still daylight. But the night is the perfect hour for the outlaw taco cart. The night is illusory, carnal, more imaginary. The day is a rigid, soulless world for the outlaw taco cart where the likelihood of getting closed down by the city is too risky . The night is the outlaw taco cart's sanctuary. 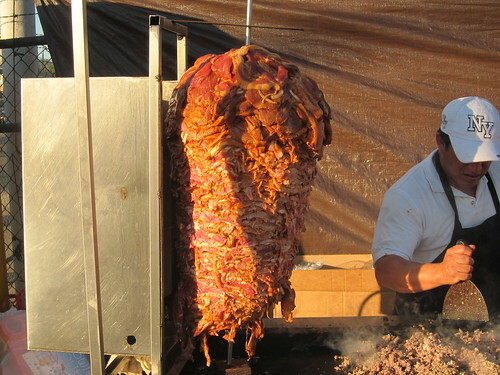 Judging from the size of the trompo they sell a lot of al pastor but when the trompo is this big it seems to be more of a convenient way to store the meat than an actual method of cooking . The pork is cut from the spit then cooked up on the grill. It’s not the ideal preparation but the tacos are undeniably tasty. My favorite taco on my plate was the buche ; the pork stomach was cooked until crispy and had distinctive porky scent and taste to it. The salsa verde was spicy and complimentary, playing to the buche’s strengths. The al pastor was not the best I’ve had but it was fresh and the salsa roja provided some good bite to the taco. What pushes these tacos over the top is how fresh they are. You taste it in everything from the tortilla to the chopped onion. And like most taco carts these tacos were $1 each which included free reign of the salsas and garnishes from the condiment table. this place is dope but it's not in Glassel Park. it's in Atwater Village on Fletcher Drive and Larga. unfortunately, they may have moved somewhere towards the end of the block because the stand is not there. BUT, there is always a guy wearing an apron on the corner, you should ask him. You should check out the spot on Ripple St and Fruitdale St in Elysian Valley. So good. this is why the taco stand is gone. thanks Buster Joe, you are indeed a BUSTER. Best taco i ate was at Bennys tacos in Venice , Ca. check them out on yelp or www.bennystacos.com. I had a handmade flour tortilla made from scratch, with the best shrimp taco, with lemon, onion, cilantro and lime. A must. Then my bf had the rotisserie chicken with garlic. out of this world. I have heard a lot about Taco food, really wish to taste it. Any one can tell me where shall I get it over here.